Well, today was the first day back and though it was not easy to get out of bed, it was actually an awesome day. My kids showed up with lots of hugs and "I miss yous" so I was smiling bright and early. I know I've said it before and I will say it again and again. They are truly the sweetest class ever. We got a new student and they embraced her at every moment. She was smiling ear to ear with all the attention she was getting! When I told the students that they were going to start doing harder reading logs and showed them a sample of one, one of my students said, "Mrs. O, these logs are way better than the other ones. These actually seem fun." Score for Mrs. O! My biggest accomplishment of the day, aside from getting a lot of mid-year DRA testing done, was that I finished my January bulletin board. 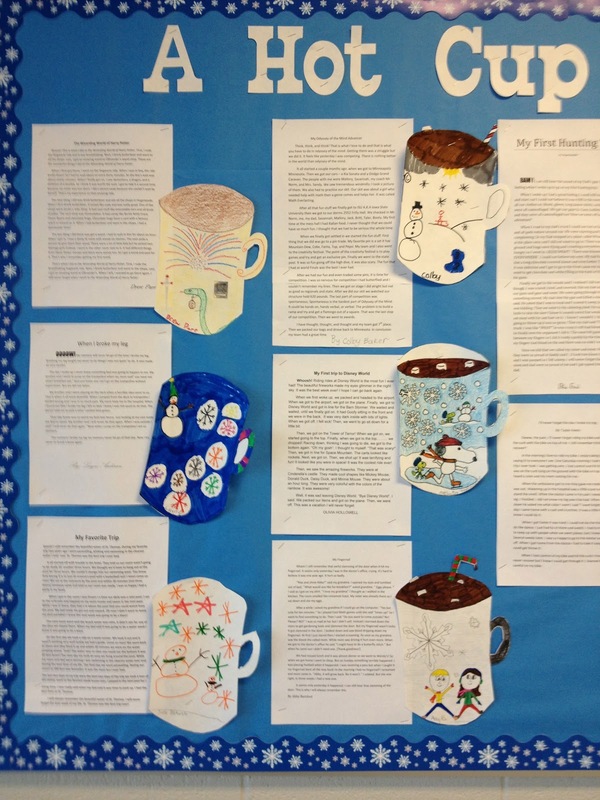 I saw a bulletin board like this on Pinterest and I wanted something to showcase our recent essay completion. We put up their essays and then they were able to decorate their mugs with a winter scene. I hope that you can tell from the one picture that I am really rubbing off on my students with my Snoopy obsession. Some of them have become quite good at drawing Snoopy free hand. Don't you just love it when students love something just because you do? I love the feeling I get knowing that they are looking up to me! It's the greatest compliment in my eyes! Teaching rocks! 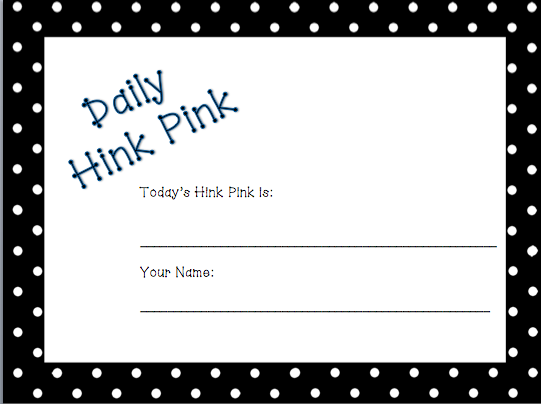 New Year Idea: Think With Hink Pinks! Happy New Year! It's officially a new year, which is a perfect time to blog about something I love, love, love! If you've answered no, then you have been missing out! But don't worry, I'm about to save you!! If you've answered yes, then it is my hope that you will have access to even more wonderful resources after reading this blog. I was introduced to Hink Pinks 8 years ago. The first school I taught in was a Responsive School, filled with Responsive Classrooms. If you don't know all about Responsive Classrooms, you can find out more by going to the Responsive Classroom Website. When I became a part of this school community, I was sent to a week-long training, entitled Responsive Classroom I. It is still the best training I have ever been a part of, for that very reason, I was a part of the training. It wasn't a death-by-powerpoint or monotone teacher in Ferris Bueller type of instruction. It was engaging and fun! We moved around, we talked about ideas, we played games that made us comfortable with one another, and at the end of the week, I was sad to leave my training behind, but super excited to go back to the classroom with all of these new ideas and activities. 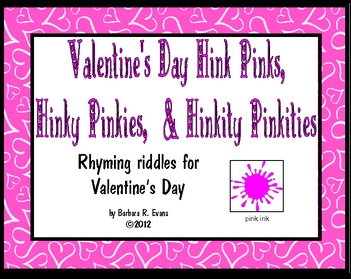 Anyway, I could go on and on about RC forever, but I want to talk in this post about Hink Pinks because they are engaging, fun, and they encourage learning! Hooray for Hink Pinks! So, what exactly is a hink pink? 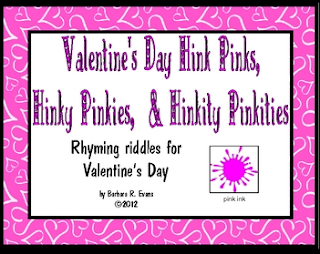 Hink pinks are fun rhyming word riddles. The answer to the riddle is a pair of rhyming words. For example, one of my favorites is What do you call a large feline? The answer? A fat cat! Seriously, isn't that a blast of fun? 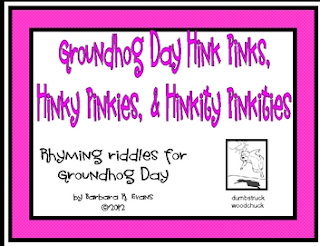 Hink Pinks are riddles that help students learn to interpret data, make inferences, draw conclusions, and analyze new information. All the while, they are working with vocabulary, synonyms, definitions, parts of speech, and honing rimes. What could be better than a fun way to work with Bloom’s Taxonomy? They place one guess per day in a basket and I choose a student to share the answer when they quietly line up to leave for the day (and I have the basket in my hand to avoid any "late" submissions). I have a lot of adults in my room throughout the day and even they partake in the daily guessing. You don't want to know what happens if I forget to post one! It's the first thing I hear about :-) If only my students knew they were learning AND having fun! 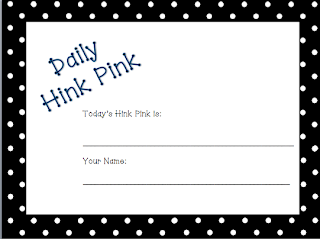 Last month, some of my students began creating their own hink pinks. They submit them to me on sticky notes at the end of each day for consideration not because I asked them to, but because they enjoy them and want to become creators of hink pinks. How amazing is it that they are challenging themselves to do that? Oh, Hink Pinks, you make a teacher smile ear to ear! Hink Pink: What do you call sugary paws? Hinky Pinky: What do you call a fake horse? Hinkity Pinkity: What do you call a conversation amongst drums?